WBC EVENT GM ASSIGNMENTS: The Preliminary Events (Orphans) List has been updated for the last time to reflect the third wave of GM commitments for WBC 2013. In all, 9 eligible events remain orphaned without a GM commitment by a current member with less than 24 hours remaining until the schedule is set in stone. Waiting in the wings are 13 eligible alternates waiting to replace events without a GM commitment. Check out the endangered list. To save one of these poor orphans submit an event form no later than March 15 and become a current member if you're not already. Endangered events include Carcassonne, C&C Ancients, C&C Napoleonics, A Few Acres of Snow, House Divided, Manoeuvre, Stone Age, Cavemen: Quest for Fire,	and Copycat. Note that the "requested" times on the Preliminary Events List are just that: requested. No times are official until they've gone through the scheduling process and been assigned available space. All GMs with "TBD" times are reminded that NOW is the time to make your final requests or forever hold your peace. This applies especially to Demos. Those requesting Tu18 or Tu17 time slots are urged to submit a second choice as the requests already exceed supply. 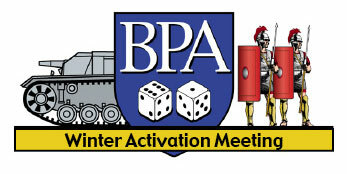 WBC VENDOR/EXHIBITOR LINKS: BPA welcomes Days of Wonder, Udo Grebe Game Design, Conquistador Games and Plaay.com, who have joined our returning favorite publishers with a presence at WBC 2013. You can find prominent links to all of them on our homepage. WAR AT SEA Final Approaches: The ninth BPA War At Sea PBeM tournament is entering the home stretch as Rob Drozd has secured his place in the Final with an Axis win over perennial contender Vincent Meconi. Rob now awaits the winner of the Tim Tow/Ed Menzel match to complete the other bracket. For two of the three it will represent their first War At Sea title. Ed won the 2000 PBeM title.